In many ways, the state of Wisconsin can almost be described as Michigan junior. Michigan became a state before Wisconsin. The Badger State is a mitten with no upper peninsula. Wisconsin has access to fewer Great Lakes. At one time, Detroit was a truly gleaming metropolis. Milwaukee, while a fine and underrated city, has never been one of America’s urban showcases. Michigan made durable goods like muscle cars. Wisconsin’s economy was based on cute things like beer and cheese. Yes, in a prior time, Michigan was the gold standard of Great Lakes states. This applied to college football as well. During the revered Bo Schembechler years, the Wolverines were the bullies of the Big Ten. It was only until relatively recently that Wisconsin was a yearly pushover for the Big Ten brutes in Ann Arbor and Columbus. Now, Michigan’s economy is trying to find itself, while Wisconsin thrives on sustainable products like beer and cheese. Detroit is a shell of its former self, while Milwaukee has actually seen population growth since 2010. And, of course, Wisconsin football has taken Michigan’s place as the bullies of the Big Ten. Ever since Barry Alvarez arrived in Madison and Wisconsin rebranded with the slanted W of death, the Badgers have bullied, beaten, bruised, and blasted the opposition right off the line and vaulted themselves into numerous Rose Bowls. Camp Randall, which once was like a friendly Wisconsin fall trip, has turned into the House of Pain. If Penn State can still be called Linebacker U, then surely Wisconsin is Offensive Line U. It may not have the same ring, but look around the National Football League and you will find some burly Badger blowing open holes for running backs just like they did in college. While Michigan still searches for an offensive identity, the Badgers just keep steamrolling along. The 2018 version of Wisconsin football certainly lives up to that standard. Monsters like Beau Benzschawel, Micahel Deiter, and David Edwards carry the proud tradition of Offensive Line U. Add sensational sophomore Jonathan Taylor running the ball behind them and the Badgers ground attack is as healthy as ever. It certainly doesn’t help the Wolverines that their top defensive linemen are hurting. Aubrey Solomon has been injured since the season began. Rashan Gary missed last week’s game with a shoulder issue. Michael Dwomfor looked done for with an in-game injury last week. Fortunately for Michigan, his injury wasn’t as bad as anticipated, but he certainly won’t be in top form for the Badgers. Finally, Carlos Kemp left the Maryland game limping in the fourth quarter. Put it all together and Wisconsin may be able to impose its will on the ground against big blue. Which is certainly good news for them, because relying on quarterback Alex Hornibrook to win a tough game on the road does not inspire confidence. Which leads to opportunity for Michigan. College football is a quarterback’s game. A top tier QB can elevate an otherwise 8-4 team to 10-2. Michigan QB Shea Patterson is an outstanding signal caller, and he has been getting better each week. Jim Harbaugh’s woes against ranked teams are well known, and if this game was in Madison, it would be an easy call. In Ann Arbor, with a shaky QB like Hornibrook under center, it requires a second glance. If Michigan defensive coordinator Don Brown can find a way to contain the Wisconsin running game, forcing Hornibrook to beat them with his arm, the Wolverines will prevail. 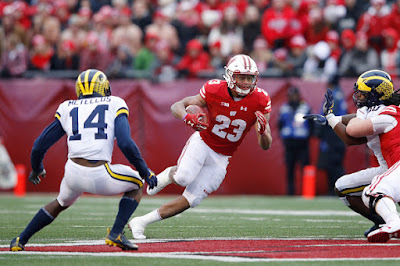 If Taylor has 30-plus carries and averages close to five yards a clip, forget it, the Badgers will win and new howls of indignation will be directed from the Michigan faithful squarely at Harbaugh. The stakes are high Saturday night at the Big House. If Wisconsin can pass this test, as well as at home against Penn State on Nov. 3, they can romp over the Big Ten junior varsity division and stamp their ticket to Indianapolis. Michigan begins its gauntlet this weekend and life will get no easier. Michigan State comes up to bat next week and when the only thing the Spartans have to play for is to beat Michigan, they are damn near at their most dangerous. Add Penn State and the yearly grudge match with Ohio State, and a Michigan loss to Wisconsin could spiral into another 8-4 year. You know, the kind of season that Michigan fans found so intolerable when Lloyd Carr was head coach. Shea Patterson may not be able to revitalize the entire Michigan economy, but it seems like the hopes of the current group of Wolverines, Harbaugh included, rest on his right arm. So crack open a beer, and set up a cheese plate, because Saturday night’s game looks like a pick’em. It should be an enjoyable, hard fought Great Lakes gridiron battle under the lights in a cool breeze.